Gifts from the Pirates: "My painting does not come from the easel"
Since our recent visit to the Tate modern a few weeks back Opeie has developed a new love of art. So much so that he has informed me that when he grows up he now wants to be an artist and wear a pencil behind his ear, which is a big change from the palaeontologist/rockstar that he wanted to be for the past year. During the Tate visit Opeie took a shine to Piet Mondrian's simple grid style pieces using the three primary colours and couldn't wait to get home and recreate the piece in his favourite media, LEGO. 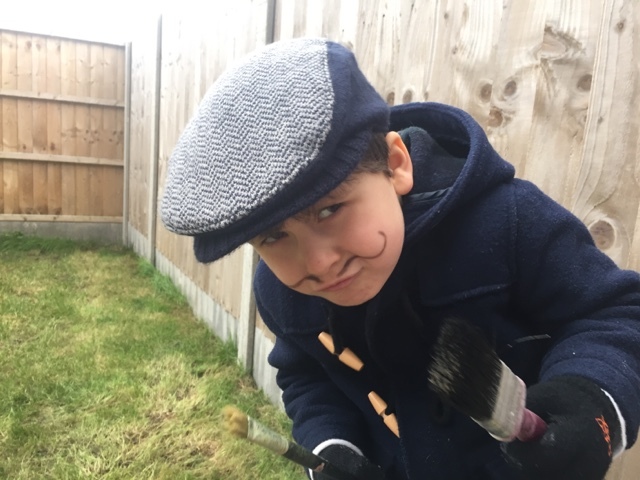 This week at 'Daddy school' we have decided to embrace his new interest and have an 'Art week'. Researching artists and their styles and then having a go ourselves, a different artist for each day. 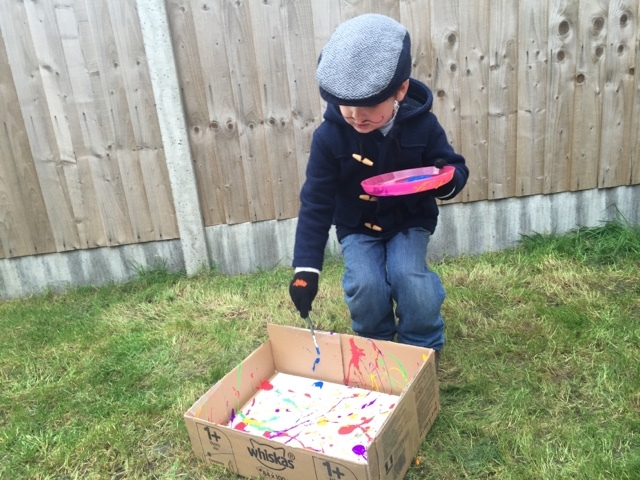 To kick start our week of creativity we chose Jackson Pollock, simply because Opeie liked the sound of flicking paint all over the place. Firstly though Mrs M had to make him look like an artist. So with a dashing moustache that Dali would be proud of we began our artistic endeavours. I love that most pound shops these days stock A4 or A3 canvas' and I usually keep some in the house for these kind of activities. 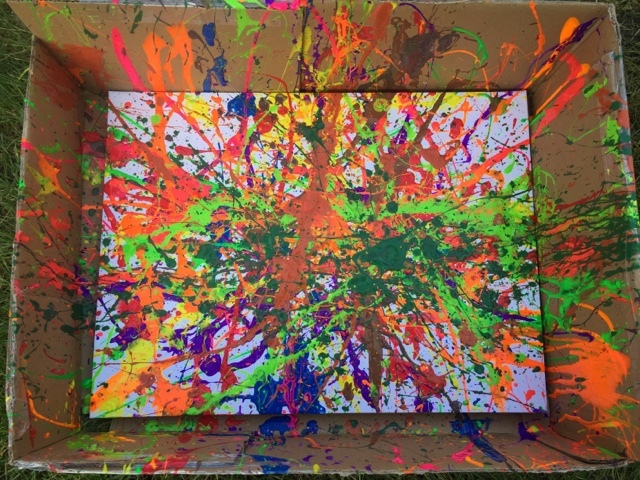 I found an empty box to fit the canvas into to try and contain some of the paint splashes and then we found all of the paint and brushes we could find in the house. As soon as Opeie started flicking that paint around he was completely focused and he was loving the art that we were creating together. 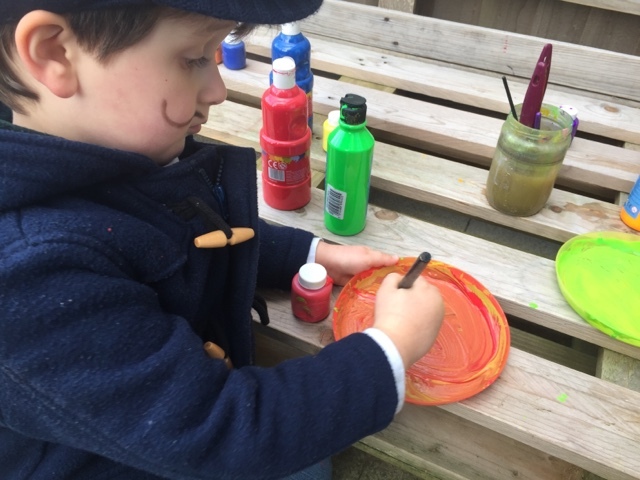 After going through the variety of colours we had in the house we turned the activity on to colour mixing which was a great lesson for our budding little artist. The finished piece came out so much better than I was expecting and most importantly Opeie was really proud of the work he had created. In 2006, Pollock's piece No.5 which he had created in 1948 became the worlds most expensive painting, when it was sold for $140 million. So I'll be holding on to this for the future, just in case.